The still life (in French, nature morte) was once considered a very minor pictorial genre, often left to apprentices working within larger compositions of the masters themselves. But the Dutch School, as well as a genius like Zurbaran, was to change all that. As in the study of the ten-thousand objects dear to Zen Buddhism, it became important to differentiate the opaque from the transparent, the hard surfaces from the soft ones, metal from silk and crafted objects from works of nature. The painters way encompassed the red glow of a large copper cauldron, the wrought fragility of a blown-glass vase from Venice, as well as the grace of a forgotten white rose lying on a table. In the visual inventory pertaining to a still life, the artist was entitled to any object he liked and to flowers, foliage, fruits, vegetables, creatures from the sea, game, bees, butterflies, birds, hounds and possibly even humans as active agents in the core of a static whole, such as fruit vendors, hunters, oyster sellers and painters at work. Gradually the importance of the genre increased. It allowed the artist to display his virtuosity and, even better, to show his personal likes and dislikes and to encompass the symbolic language of flowers, as well as the efflorescence of well-chosen metaphors. His reflections often developed into a philosophy, and this is the beginning of vanity pictures in which objects symbolize the transitory aspect of life and human endeavors. After The Asparagus by Edouard Manet, The Apples by Paul Cezanne, The Sunflowers by Vincent Van Gogh and the intellectual approach of the cubists, the still life became an integral part of modern art. All possible variations and permutations were welcome, from riddles to hidden meanings and ciphered thinking coded as enigmas. 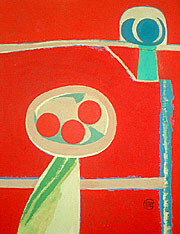 In my work, such as The Philodendron (1943), the whole scheme is color oriented and displays vibrancy. The plant is silhouetted against the garden of my parents home in Neuilly. Later in 1952, Still Life with Fruits (see Curriculum Vitae page) carries an allusion to ceramics, which at that time interested Pablo Picasso almost exclusively. Yet the plate displayed on the wall is not one of his creations, but is a peasant piece of majolica that we had collected with some ancient Hispano-Moresque dishes for the dining room. In The Shed with Garden Tools, of the same year, an empty flower pot and a trowel are present, but instead of the bulbs beginning to germinate (a promise of renewal), there is a rather threatening gaping pair of shears and the kind of string coiled around two bamboo sticks that gardeners use to trace straight furrows (a symbol of rectitude). The obvious implication is softened by the emerald vista from a window and by a door ajar on the greenery outside. As the shears reappear either open or closed in six or seven compositions during that same year, I cant help but think that this object characterized my will to cut out an image of life more in keeping with my desires of personal independence and a way of being thoroughly oriented toward rigor and integrity. From 1960 to 1988, my still lifes are often self-enclosed compositions devised with a solid structure, saturated color schemes and sometimes a recourse to remembrances. If I wanted to count the flowers most often represented in my paintings, tulips would probably come first. Their stems have a unique snake-like way to gravitate toward the light while their corollas, self enclosed to start with, open up to reveal the unexpected tonalities of their etamines and pistils. During their decline they become desiccated and arch backward like Mongolian contortionists. I like tulips, but also crocuses, narcissi, daffodils, hyacinths and lilies because each in turn brightened my parents garden at Neuilly. However, in all fairness, I also see them as an indirect homage to the Dutch still lifes of the seventeenth century  my contribution to the unending debate between nature and culture. The still life Idol, Child and Tulips (1991) seems a good example of a successful riddle. In the center, the flowers in the vase provide a rich interlay of intense color and intricate shapes. Its mass detaches itself in front of a dark blue background and monopolizes the viewers attention, yet it doesnt take long before the viewer becomes intrigued by the presence of the idol in the half-shadow and the child relegated to the second plane beyond the table. The necessity of their imminent presence soon acquires more weight than the purely decorative impact of the bunch of flowers. Starting from right to left, it is also possible to decipher: Idol = the past, Tulips = transitory aspects of the present, Child = unavoidable growth toward the future. The vanity reference to death is the dark door opening in the center of the canvas, a gaping mouth partly hidden behind the tulips, quite ready to engulf the whole composition and absorb wholeness into nothingness. What counts in a riddle is that it should combine several different thoughts. It leads the way to other possibilities by the displacement of meaning. 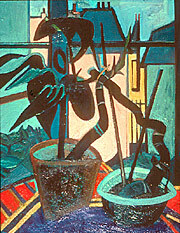 Evocative of Gilot's memento mori canvases during the Occupation, the images of this work represent the symbolism of a window in a crucifix form juxtaposed with the withered stocks of philodendrons, their dark leaves silhouetted against the cool light, agitating as they obscure the view of the garden and the adjacent mansions of the residential area in Paris where she lived with her parents. In spite of the bleak, somber colors, and the entanglement of the taut scheme, Gilot offers hope in the reflection of the pale pink tone central to the composition. 31 7/8 x 39 1/2 in. 31 7/8 x 25 5/8 in. In this oil on canvas, the working of the different parts seems not only simple, but simplistic. Several circles of the same size, if not all of the same color, recur in different locations, as do a number of parallel and perpendicular lines. Only a diagonal on the first plane and a shorter one in the opposite direction on the second plane animates the surface, which without them would remain entirely flat. The blue flower in its turquoise green vase lifts its foliage (made of circle parts) like arms to counteract three very quiet oranges precariously balanced on a perfectly circular plate. Because the plate is not elliptical according to the dictum of perspective but shown perfectly round, it should logically follow that it is vertical and, therefore, the oranges should be in the process of falling - an impossible occurrence. Since they are exactly the same color as the overall background, the oranges participate in the plates forceful stability. At the same time, all the parts in pale ochre can be read as negative spaces or as graphic signs that allow the passage of light but nothing else - in all simplicity.